We have been working hard to prepare our plug-ins for FileMaker 17. Later today we will release more information. Stay tuned or subscribe to our newsletter. The release of version 17 of the FileMaker Platform brings a lot of new features. You can now very easily create a new database by selecting a starter app. In FileMaker 17 you can now also add more functionality to a database later with the help of Add-on tables. If you add a portal to a layout and select the add-on table you want (for example an action items table) FileMaker 17 will create a complete table with fields and all relations. 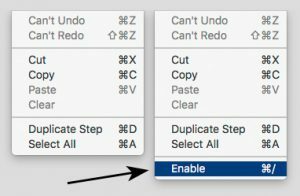 Enable script steps is only available in the script edit menu of FileMaker Pro Advanced 17 with developer tools enabled! What is remarkable is that the release of the FileMaker 17 platform also marks the end of FileMaker Pro as a separate product: FileMaker Pro Advanced replaces FileMaker Pro. From now on there is only one application for the desktop. TIP after you install FileMaker Pro Advanced these developer tools are not available right away, you have to check the “Use advanced tools” in the preferences and restart FileMaker. This might not seem obvious, for example you might get confused why you cannot enable/disable a script step. This feature is disabled until you enable the advanced tools. Another interesting enhancement is to the “Perform Script” step: you can now use the new Specified by Name option and specify the script name in a calculation: this allows for much more flexibility in determining which script to run. You can make it data driven and it can be for example be based on a ‘script dispatch table’ in a database. 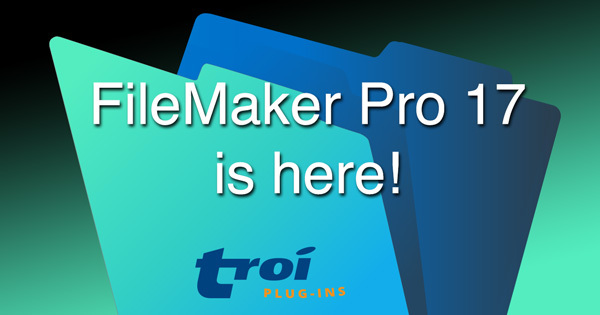 FileMaker Pro Advanced includes features that help you develop and deploy FileMaker Pro Advanced custom apps faster and more efficiently. These features are available when the Use advanced tools general preference is selected. Use the new Create window to create custom apps based on Starter apps for many common business tasks. Also, explore the Sample apps to see more of what’s possible to create with FileMaker Pro Advanced. You can add Add-on Tables to your custom apps to track many common types of related information. Redesigned Layout mode – Create and edit fields, work with multiple objects at a time, and use the Inspector without opening separate windows and dialog boxes as you create and edit layouts. Portals for master-detail layouts – Portals can now display records from the current found set, making it easier to create master-detail layouts. Selecting objects in a group – On a layout, select, resize, move, and format individual objects that are in a group without ungrouping them. Universal Touch theme – Used by Starter apps and Add-on Tables, this new theme includes several sets of styles in a single theme, so you can more easily combine various styles in the same layout. The neutral color palette makes customizing this theme easy—just add your own colors to a few styles. Improved file management – Easily open files and manage your favorite files and hosts. Multiple email attachments – When sending email, you can now use the Attach Files option to attach multiple files to each message. Default fields – When you create a table, several commonly used fields are now automatically added. Copying and pasting custom menus – You can now use standard keyboard shortcuts to copy custom menu sets, menus, and menu items and paste them into another FileMaker Pro Advanced file. Improved responsiveness while reconnecting – If you lose a network connection to a host, you can continue working with files that don’t depend on that host while the connection is being restored. Account lockout – After trying unsuccessfully to sign in to a hosted file several times within a few minutes, you are not permitted to try again for several minutes. Configure Local Notification – Queues or clears a local notification for an iOS device. Open Hosts – Opens the Hosts dialog box. Open My Apps – Opens the My Apps window. FileMaker Data API support for performing scripts. Create directories option – Some script steps that save and export records and data now include a Create directories option, which allows creation of new directories that you specify in the output file path. Note that you can also create folders ànd delete folders with Troi File Plug-in. Insert From URL – You can now force data that’s returned in a variable to be stored as container data. Open Launch Center – This script step is now Open My Apps; it opens the new My Apps window. Open Remote – This script step is now Open Hosts; it opens the new Hosts dialog box. Perform Script and Perform Script on Server – By using the new Specified option, you can select a script from a list or specify the script name by a calculation. Send Mail – You can now attach multiple files to each message. Show Custom Dialog – You can now use variables for input fields. Get(ActiveRecordNumber) – Returns a number representing the record that has focus in the current found set. Get(UUIDNumber) – Returns a number representing a large Universally Unique Identifier (UUID) value. GetSensor – Returns the value of a specified sensor for an iOS device.